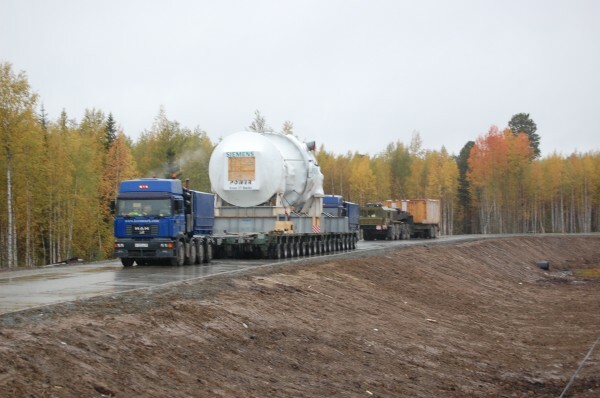 Fortum Company intends to complete construction of Nyaganskaya SDPP two years before the planned term. As they explain this, it is possible thanks to well-coordinated work of Contractors who were through with the first phase of a tailor-made shipping operation on delivery of equipment to the SDPP site. Nyaganskaya SDPP is a very interesting facility. On project implementation it shall become one of the largest thermal power plants in the world, operating to the north of 62˚. 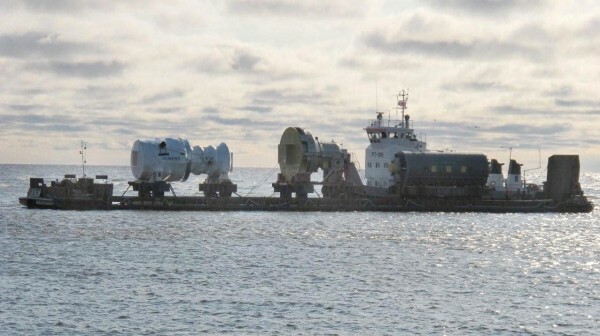 Furthermore, it is actually the only project in the Russian energy industry that was initiated «in a green field» and has become a turnkey project. Its efficiency will exceed 56% which will enable perfect competition in power. One of the main project execution phases was completed last year. 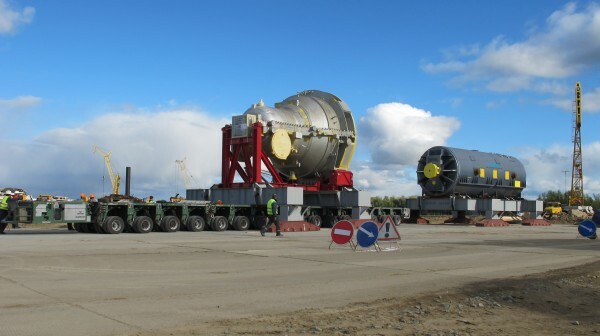 Basic and auxiliary equipment for the first generating unit weighing several thousand tons arrived at the construction site of Nyaganskaya SDPP. This had been preceded by significant and large-scale work. 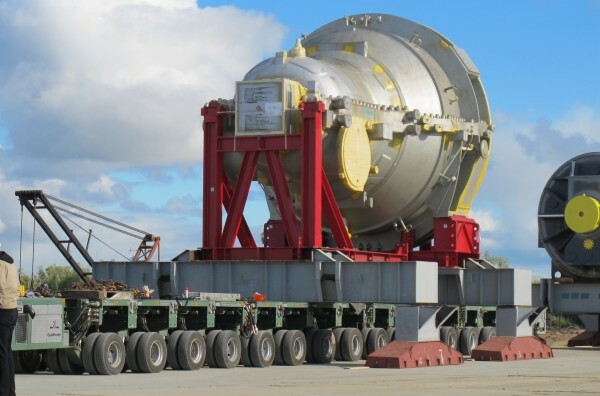 «Construction had to take place under hostile weather conditions, surrounded by woods, swamps, with a complete lack of necessary transport facilities to deliver oversized cargoes. 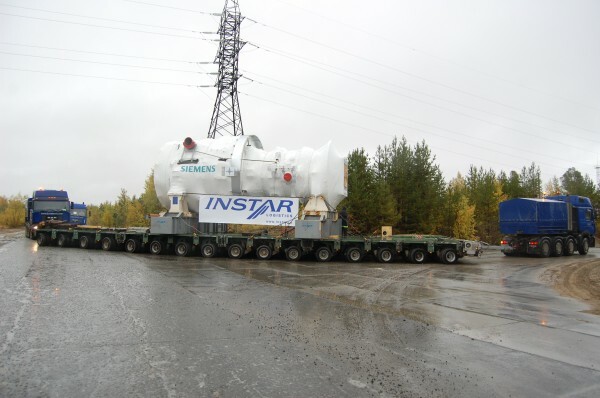 Few believed it real to truck the required equipment to this area», told Alexander Shelkov, General Director of INSTAR LOGISTICS. – On instructions, given by the then General Contractor E4 Group, we analyzed the water and transport system of that region, climatic and weather conditions, and decided that it will be difficult but real to deliver the energy equipment». For this purpose engineers intended to uplift transmission lines, reinforce the pavement and design a special pier for the barges. By the way, that pier is the only structure in the region – it was built in the shortest amount of time. Certainly, construction was performed by high-skilled specialists who have rich experience in building such facilities. They drove 23m sheet piles into the ground, removed 100 thou m3 of sand and covered the slope with concrete slabs. This task was complicated also because the Ob shores are high in that area – seasonal water level difference is a serious obstacle. Therefore, it was required to build a capital facility with a long approach canal. 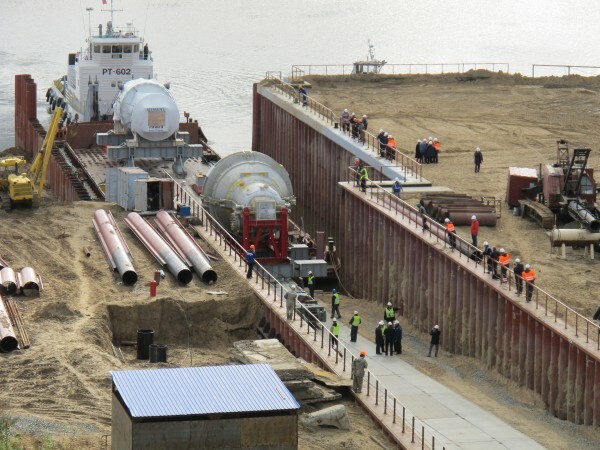 To facilitate transportation of cargoes from the pier, descent to the river was smoothed. Another serious, and maybe the most difficult challenge, was the bridge across the Krestyanka River. To haul the turbines, the bridge was strengthened as two of its spans aroused everybody’s alarm. Traditional strenghening methods were useless. The bridge had to stand 480 tons of extreme load (the weight of cargo and a road train). The final solution was unusual – to reinforce the bridge structure with coal plastic. This technology of armoring the structure by composite carbon fibers made it much stronger. Such elements as bands and canvases are used for armoring. Use of coal plastic enables to avoid complicated and labor-intensive strengthening of reinforced concrete, brickwork and wooden structures by metal. Operation of such difficult structures as reinforced bridges, floor slabs, farms and columns proves high quality of coal plastic. What is most important here is that application of coal plastic is not time-consuming, cheap and very efficient. 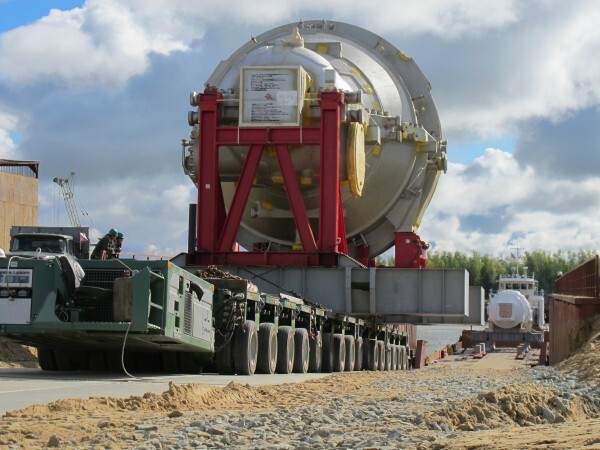 It’s a rare technology in Russia, used for the first time to transport the heavy equipment. Therefore, the freight company had to face the Russian conservative licensing system and prove the usefulness of this option. 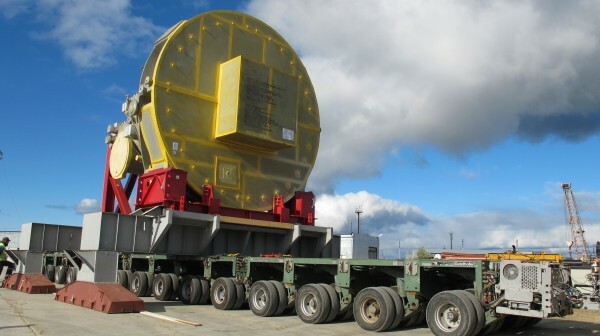 Research was ordered in three design institutes that issued a report that this technology is reliable and the bridge is strong enough to let through the large-tonnage cargo. At last, the permit was granted. 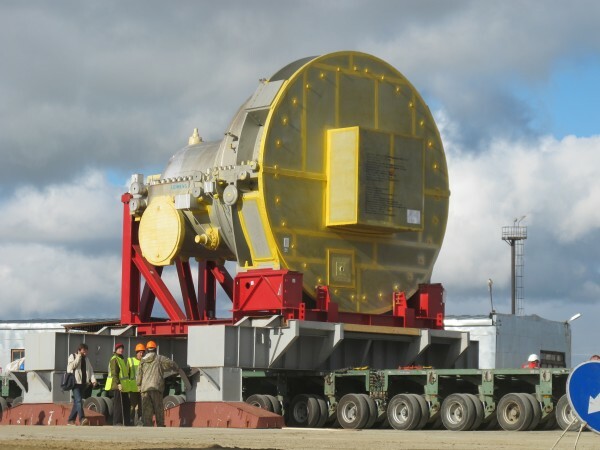 The first power unit for Nyaganskaya SDPP included cargoes from all over the world – Malaysia, USA, China and Germany – the gas turbine (305 tons), the steam turbine (199 tons) and the generator (342 tons). The initial task was to consolidate all cargoes in Europe, in the Port of Rotterdam. On July 20th, the units were loaded on Beluga Houston vessel, equipped with three cranes, two of which had up to 700 tons of lifting capacity. 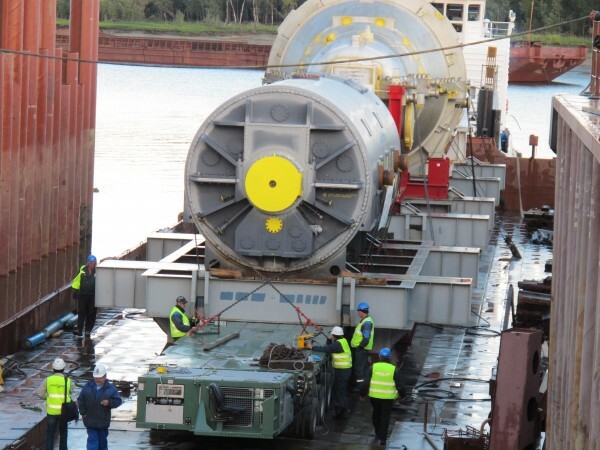 Then the consignment was shipped to Murmansk Port to clear the power unit. After the handling of all Customs formalities Beluga Houstan left for the Gulf of Ob. 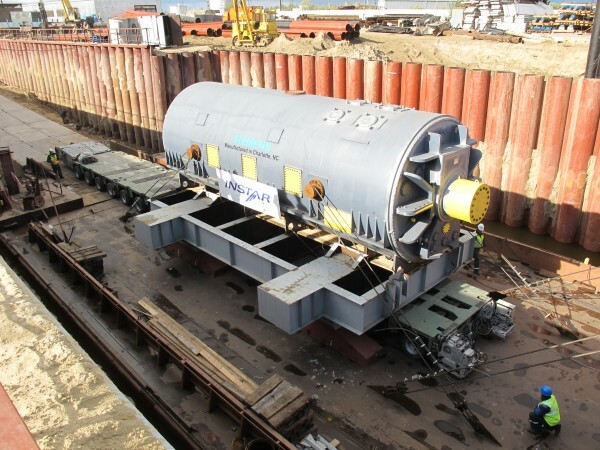 Here, in the open sea, the units were reloaded on specially fitted barges by cranes within a week. 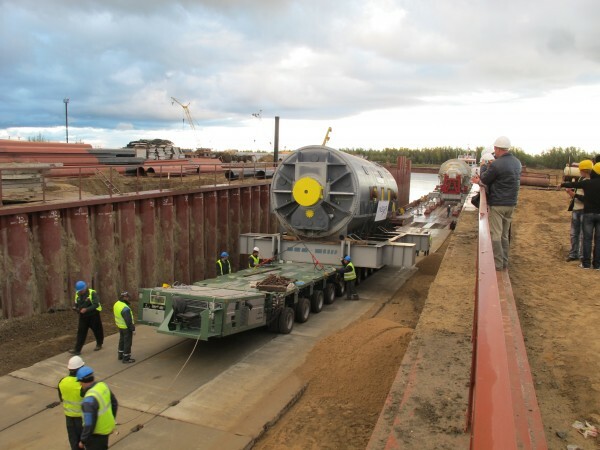 This operation called for serious preparation as well, as all the changes of the structure had to be coordinated with the Russian River Register. Furthermore, the cargo had to be secured. The manufacturer expressed his tough requirements to bearing points and fastening. Four barges were used at this freight phase, each carrying its own cargo – one heavy and three general. They moved in the direction of Priobye village for the unloading. The barge with OOG was ballasted to even it with a pier wall. 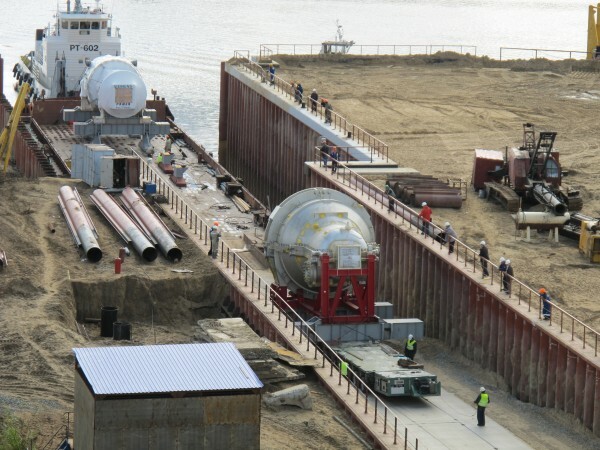 The lots were rolled off with some difficulties, because the banks in this part of the river were rather steep and the entire cargo had a high center of gravity. 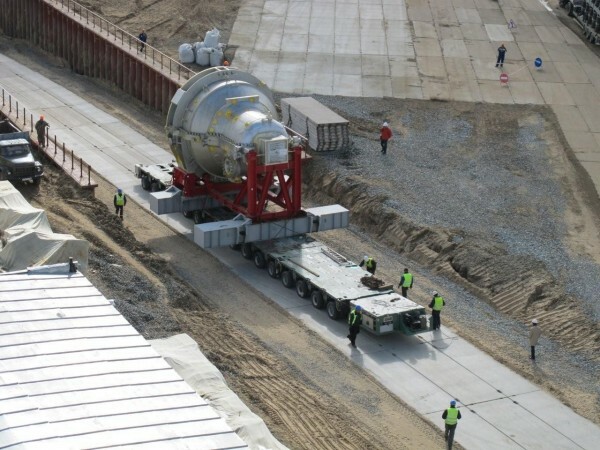 Energy units were taken by a Goldhofer SPMT, and it was the first such experience in Russia. 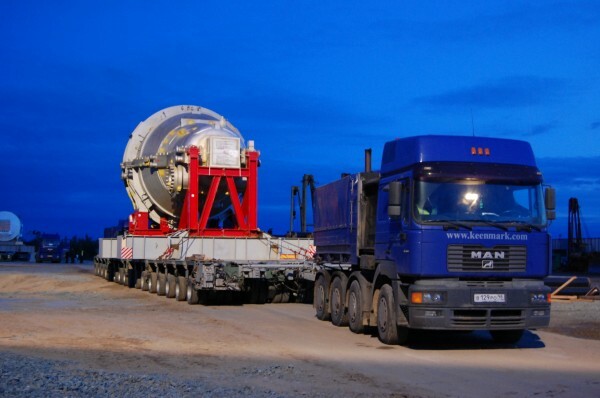 The same transporter moved the turbine across the bridge which implied lesser loads. The lightest element – the steam turbine - was the first to come, followed by the gas turbine and generator. After each passage the bridge was thoroughly inspected and its qualitative figures were measured. 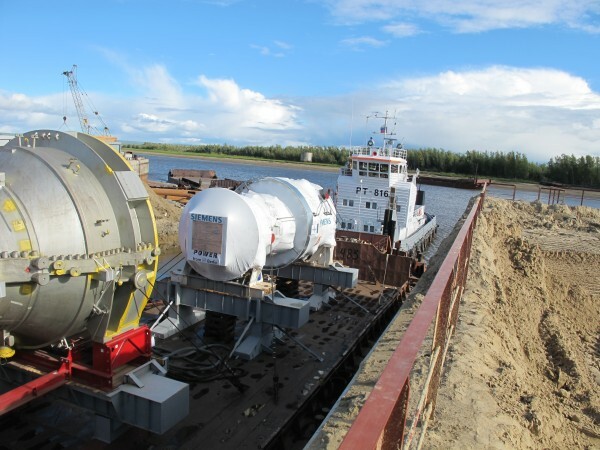 The haul rig weight with the heaviest load hit about 500 tons, and the upper altitude came to 8.5 m.
Discharging of barges and storing of cargo in the Port of Priobye was completed in several days. Company initiated delivery to the SDPP site on September 7th. The total way from the port to the construction site is over 50 km. Two more kilometers with a railway crossing were built. The delivery operation was successfully finished on September 18th. The thermal circuit of the turbine house in the main building has been closed, common administrative quarters and a combined auxiliary room of water treatment plant have been built.